For some pet owners, a vacation feels incomplete without a four-legged friend. But preparing for a pet's trip means more than packing her toothbrush. Here's how to guarantee great memories. Ask yourself if your pet is up to the journey. "Most cats are happier at home with a sitter," says Louise Murray, director of medicine at Bergh Memorial Animal Hospital, in New York City. For any pet, the next-best thing to staying home is feeling safe. 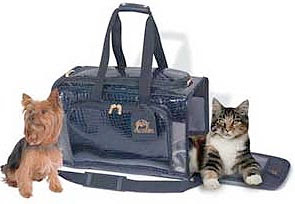 Greg Kleva, trainer and host of It's a Dog's Life, on Martha Stewart Living Radio, recommends familiarizing your pet with her carrier, since most transportation requires one. Leave it out and open for a few weeks before your depart. Just before travel, cut your pet's nails, so they won't catch in the carrier. Make sure she wears her regular identification tag, plus a travel one with contacts at your destination. Since dangling tags can catch in the carrier grate, secure them to your pet's collar with tape. Label the carrier, too. For pet-friendly accommodations and attractions, consult Traveling With Your Pet: the AAA Pet Book. Kleva also likes the websites tripswithpets.com, dogfriendly.com, and pettravel.com. If you're flying with a small pet, choose an airline that will let her ride in the cabin, under the seat. If your pet is too large, consider driving or leaving her at home. "Cargo is unsafe and uncomfortable, plus frightening for the pet," Murray says. Think of it as a last resort. If you need to fly but don't want to risk cargo, Pet Airways (petairways.com) flies animals in their main cabin. Or you can hire a transport service such as TJR Express (tjrexpress.com) to drive your pet to your vacation spot. "Trains tend to be a safe and comfortable travel option for short to medium distances," Murray says. Call ahead to make sure the train permits pets. Ask about crating rules, as well as any break time en route. Don't let your pet travel in cargo during the summer, since there may be no air-conditioning, and avoid sedation. Car travel is ideal, since you can make frequent stops to exercise your pet (don't forget her leash) and offer water. If she isn't used to driving, take short rides in advance, gradually increasing their length. Many states require that owners use pet-restraint systems such as harnesses, car seats, and mesh vehicle barriers. Roaming pets can distract drivers and, in an accident, can become flying projectiles. Some pets are prone to motion sickness. Calming a pet's nerves with toys or treats, cracking a window for fresh air, and taking rest stops every few hours can help. For serious car sickness, your vet may recommend a medication.